“Oh crabapples, you’re the most atrocious troll I’ve ever seen in my life.” (Page 31). Thistle has always wanted to cross the Mangleblood River, but as a troll and Mud she has been told not to. It isn’t until a crow steals her beloved nan’s medallion that she gathers the courage to defy her king and find a way across the river. Her friend Fane finds her as she searches for the way and joins her in the quest. Together they cross the river and find something so new that Thistle will lose herself temporarily in its shininess. 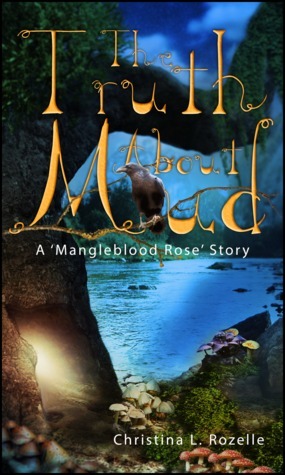 There are a few themes touched upon in The Truth About Mud that are fascinating to read about in the context of a story about Trolls and Mud and a gross-out kind of environment that as humans we are entirely not used to. The world Rozelle builds is so unfamiliar to us that it is mesmerizing in its depth of uniqueness. The characters are Trolls and live a very different life than humans and Rozelle builds up their environment expertly to show how they live the way they do and what’s important to them in their world. I found the ‘gender’ difference and the ‘species’ differences to be fascinating, especially as presented in a seemingly harmless fantasy world. Mascues and Femmes I assume are similar to males and females as we would kind of know them in our human world. Mascues are masculine and tough, but also very gross and very troll-like. They train and are warriors. Femmes are feminine but also very gross and they have powers of enchantment. The author sticks with typical gender roles, but extends them beyond the norm for her world infested with boogers and mud and yucky things. Treasures and Muds are two types of trolls that are separated by the Mangleblood river. The way Rozelle plays with stereotypes and prejudices of one species of troll with another almost mimics real world stereotyping. This novel was published by CreateSpace Independent Publishing Platform on January 19th, 2015 and is available on Amazon here.